The Lynx is a type of wild cat that is medium in size. It offers a great look with brownish gold coloring. The underside is white and the fur has black spots on it. The tail is much shorter than for other types of animals that fit in this same type of category. They are well known in many areas of history too including being the National animal of Romania. Some find the name to be very interesting. In the Greek language it means shiny eyes. There are four species of the Lynx that remain today. According to some forms of research regarding evolution there may have been many more species that are now extinct. 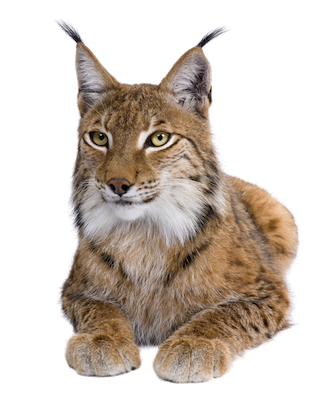 Those that remain are the Canadian Lynx, Eurasian Lynx, Iberian Lynx, and the Bobcat. The locations where they live is quite varied for the different species. Many of the Lynx live in the open plains areas. Others live in the mountains or in the forests. The key to their survival is being able to have a wide home range where they can find enough food. However, as their natural habitat shrinks they may find it harder to get access to their prey. They consume various foods including mice, rabbits, deer, and even fish. They are able to swim naturally due to the design of their bodies. They have extremely sharp teeth that allow them to take down prey. They can capture animals that are several times their size due to the strength of their teeth and jaws. The Lynx is ready to mate at one year of age. The males mature about one or two full year later than the females. Mating will take place in the late winter so that the young kits can be born during the warmer period of the year. They will have to learn how to fully care for their own needs by the time the following winter rolls around. The mothers take very good care of the young but it can be difficult. She will create a den for them to be born in. They will have to remain there on their own often as she goes to find food. If she can’t find enough to eat her body won’t create milk for them. By the time they are four to six weeks old she will be bringing them back meat to consume in addition to the milk. The Lynx has a very short tail. When it is time for the young Lynx to care for themselves they will be very vulnerable to predators. They will form small groups that does give them some safety from predators. They can also collaborate their efforts to make hunting for food easier. The females are going to live a life that is very isolated. The exception to this is for mating or when they have young to provide for. With the right conditions a Lynx has a life that ranges a period of 13-15 years or so in the wild. In captivity they have been known to live up to 20 years. While these animals do seem to do decent in captivity it isn’t a substitute for them being in the wild. Scientists have been able to study a great deal about the Lynx this way. The future for the Lynx is uncertain at this time. One of them is classified as critically endangered. There are conservation efforts in place to help them though with protecting their natural environment. It is illegal to hunt the Lynx in most areas but unfortunately the poaching of them continues. There isn’t enough manpower in place to successfully take care of all the places out there where these animals are being illegally killed.